In 1909, Max Liebermann commissioned architect Paul Baumgarten (1873 – 1946) to build a country house in neo-classical style at the Grosser Wannsee, and placed the building in an architectonic garden setting. He drew up the basic concept for the site himself and developed it into a modern garden together with Alfred Lichtwark (1852-1914), the director of the Hamburger Kunsthalle. To the front of the house is a large garden bordered by a high hedge of lime trees and planted with fruit and vegetables as well as herbaceous plants. The central path runs directly to the house, providing a link to the interior rooms. A terrace on the lakeside of the house offers an open view across lush flowerbeds to the lake panorama. To the right, a straight path runs down to the shore through a birch grove; to the left are three long hedge gardens. The garden provided the artist with key motifs for his late work: he captured the paradise which he had created for himself and his family – “My Castle by the Lake” in more than 200 oil paintings, pastels and graphics. Today, the garden has been restored as originally designed by Max Liebermann – an artist’s garden, composed with an eye for colour and light. Max Liebermann (1847-1935) bought a site in the Villenkolonie Alsen in 1909. The architect Paul Baumgarten (1873-1946) built the painter’s summer home, which also found expression in Liebermann’s pictures, in what was at the time an untouched lake landscape on Berlin’s doorstep. While the surrounding villa gardens were still designed in the landscape tradition of the 19th- century Lenné-Meyer school, the garden designed by Albert Brodersen (1857-1930) was to be an impressive work of new 20th-century garden design. 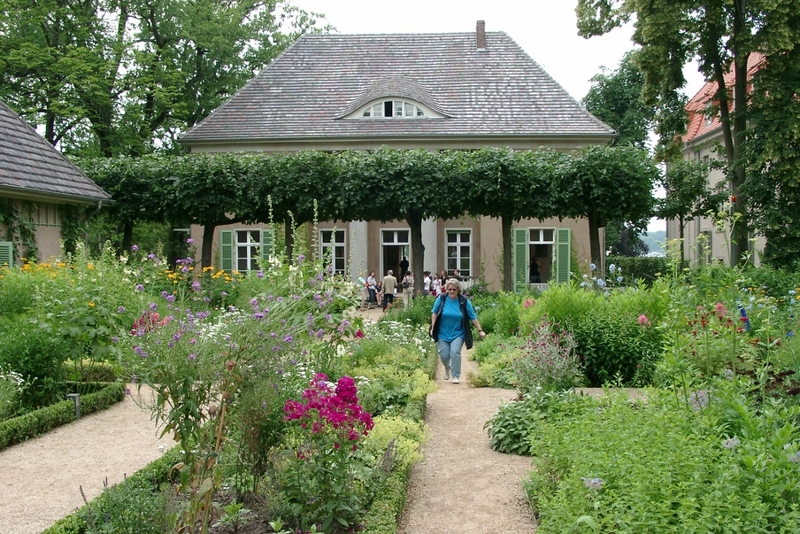 The garden not only adopted architect Alfred Messel’s reform-oriented principles of design but also took up Liebermann’s ideas and those of his artistic advisor Alfred Lichtwark (1852-1914) at a time when the debate over the stylistic reorientation of German garden design was reaching a climax. Within two years, a modern garden had been created which was an excellent reflection of the radical change from the landscape style to a purely architectonic garden style in garden design at the time. The garden also reflected the ideals of garden reformers, one of whom was Alfred Lichtwark. The lakeside area of the garden consisted of a large lawn with an open view across the Wannsee. It was Liebermann’s wish that the small birch wood on the right of the site should be included in the garden’s design. It recurs time and again as a motif in his paintings. Every year, different summer flowers were grown in the flowerbeds on the terrace. Liebermann had red geraniums planted, which provided a strong splash of colour right into the autumn. A garden bench from which it was possible to look across the flowerbeds to the otter fountain designed by August Gaul (1869 – 1921) was placed on the south side of the terrace. The three hedge gardens to the north played a central role in the garden’s overall concept. They formed the heart of Alfred Lichtwark’s thoughts on garden design. The “green rooms” formed by hornbeams were designed to awaken curiosity about what was hidden behind the hedges. An open-air architecture room constructed by nature was created in the first hedge garden. Twelve lime trees with trimmed crowns were planted in a square, producing a green canopy above a square area. The central hedge garden featured a large oval path with an area of lawn and a round flowerbed. Round trees and ornamental lilies in containers marked the points where the paths intersected. Narrow borders of irises were planted in front of the hedges. The garden bench was the favourite spot of Max Liebermann’s granddaughter, Maria. The third hedge garden was laid out as a rose garden. Its cross-shaped layout of paths was reminiscent of the basic layout of traditional farm gardens. There was a sundial at the centre, which was later arched over by an octagonal rose arbour. The front garden was taken up with a lush flower and vegetable garden. The herbaceous section stretched out next to the gardener’s house across the whole width of the site. Every year, varied colour combinations which repeatedly inspired the artist to paint new paintings were created here by a huge variety of summer flowers along with dahlias and hollyhocks. The villa was positioned at an area of lawn flanked by four round box trees A high hedge of lime trees, such as those typical of northern German farm gardens, screened the house. The axial direction of the garden path to the villa allowed an ideal view from the hallway into the front garden and, when the doors were opened, through the house to the Wannsee. The clear form of Liebermann’s garden was also reflected in his pictures, the years at the Wannsee being marked by immense artistic productivity. The main motif in 1915 and 1916 was the flower terrace with its strongly contrasting colours. In 1917, views of the cabbage patch were added. From 1919, Liebermann also painted pictures of his granddaughter Maria, whom he captured on canvas while she was playing in the garden. In 1920, Max Liebermann accepted an appointment as president of the Prussian Academy of Arts and in 1927 he became an honorary citizen of the city of Berlin. All the more tragic was the fate of the family after 1933: ostracized by the National Socialists, Max Liebermann died in 1935. His widow was forced to sell the house in 1940 and avoided deportation to Theresienstadt in 1943 by committing suicide. The forced sale of the house and garden in 1940 had far-reaching consequences for the garden. It disappeared almost completely due to the takeover of the villa by the Reich postal service and as a result of its use by the Wannsee hospital from 1945. Basic care of the almost vanished garden began after a diving club moved into the villa in 1972. When a decision was taken in 1995 to extend the diving club’s lease until 2015, the Max-Liebermann-Gesellschaft. which had been founded shortly beforehand, protested. This protest led the authorities to rethink their position. In 1995, the villa was put under a protection order and in 1997 the Berlin House of Representatives decided that it should be used as a museum. Renovation of the building and reconstruction of the garden began in 2002. After the villa and garden had been restored, the house was opened to the public as a museum in 2006. Today the garden has been reconstructed as originally designed by Max Liebermann – an artist’s garden, composed with an eye for colour and light. Paintings, photographs and letters in which Max Liebermann wrote extensively about his planning for the garden provided a basis for this reconstruction work. Besides the hedge gardens and the vegetable garden, particular attractions today are some historical and now rare plants such as a Tithonia (Mexican sunflower). 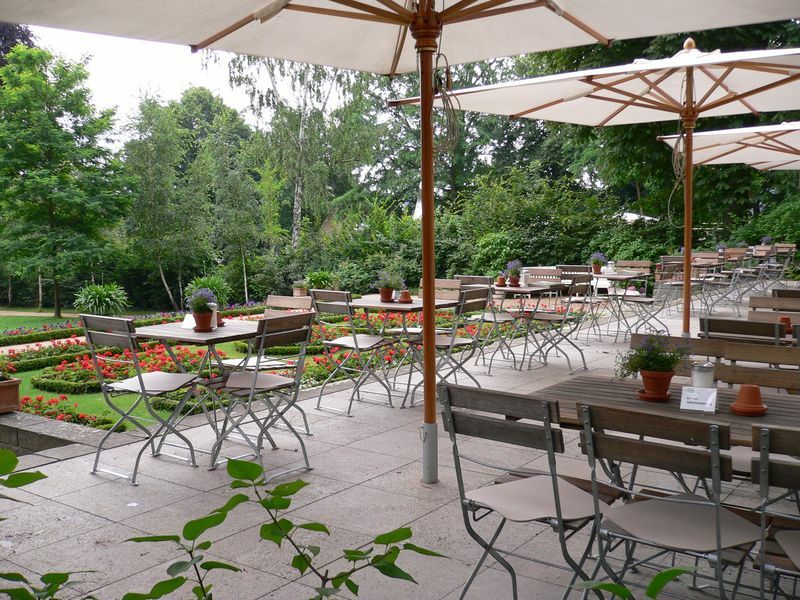 Visitors on the terrace can let their gaze wander across the garden and lake and enjoy the special atmosphere of Max Liebermann’s “Castle by the Lake”. Owner / Management: Max-Liebermann-Gesellschaft Berlin e.V. Open on public holidays, but closed on 24.12. and 31.12. 5 Euro / 4 Euro, reduced p.p. Café: Cafe Max located in the Liebermann Villa, outdoor seating with stunning views on garden and Wannsee. Catalogies for inspection available here. Parking: No own parking area. Public parking 700 metres. S-Bahn-Lines 1 and 7 to S-Bahnhof Wannsee, then by bus 114 to stop „Colomierstraße“.